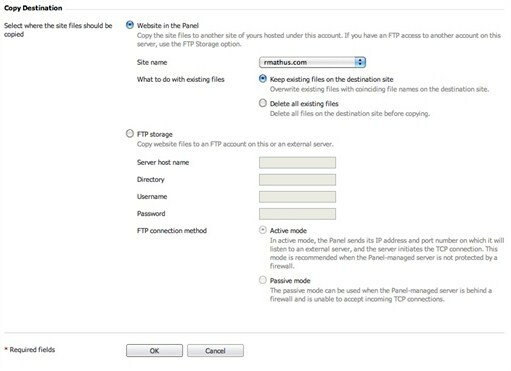 This article describes how to copy website data to a different domain or FTP site within Plesk. This is useful for copying a development environment to a production environment or vice versa. It is also good for customers who are not familiar with SSH and would prefer to copy files via the Plesk interface. 1. Log into the Plesk administrative interface by navigating to https://<ip_address>:8443 as the server administrator. A self-signed certificate may show an error in the browser in which case it is OK to accept the self-signed SSL. 3. This will open the control panel for that domain. Under this new tab/window, click Websites & Domains. 4. Expand Show Advanced Operations and then click Website Copying. 5. From there, select the domain you're copying to in the drop down. Select whether you're simply copying files and overwriting existing files or deleting existing files and copying. Alternatively, you can set the files to copy to an FTP repository by entering in the FTP details.